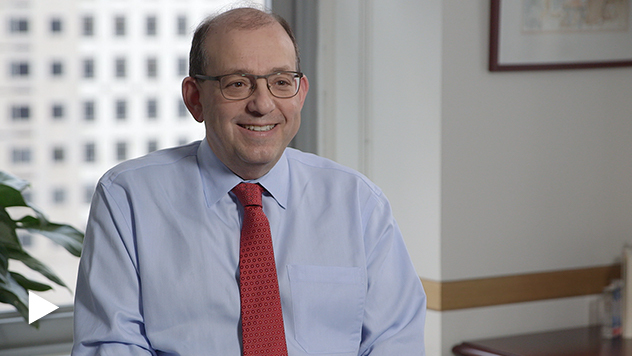 PM Jay Kaplan discusses his perspective on our small-cap dividend value approach and his outlook going forward. What’s your perspective on how Total Return did in 2018? If I’m being honest, I would say that we were a little disappointed in Total Return in 2018. 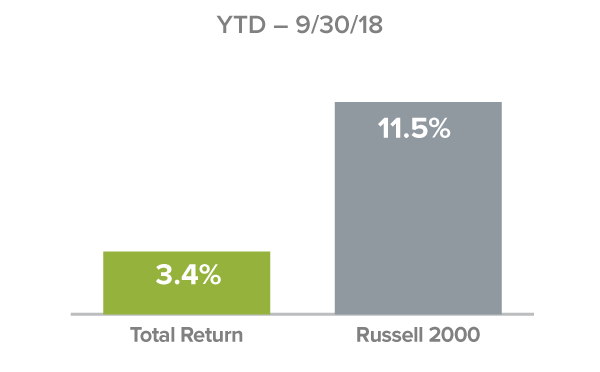 We underperformed the Russell by a little bit. But I think there’s more to it than that. It’s a bigger story. I think you have to think about what transpired in the year. The year really had two different stories. The market was very strong for the first eight months or so and really came apart at the end. 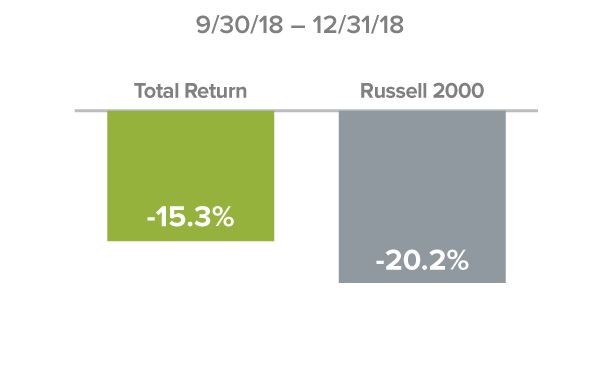 So if you look at the fourth quarter of ’18 for example, the Russell 2000 was down 20% in the quarter. Folks often think that 20% is a bear market. We had one in 12 weeks. So I think it’d be helpful to look at two different parts of the year, and in that second part of the year in that fourth quarter, we were about 500 basis points better than that down 20 Russell bear market. So I was actually pretty pleased about the fourth quarter. No one likes to lose money, but the value proposition for the Total Return Fund has always been when markets are really, really good, the lower volatility strategy that we run is going to underperform a little bit, but our hope has always been when times get tough—and we hadn’t seen a tough time in frankly a really long time—when times get tough we will do a little less bad, and I think we proved that this quarter, and if we are in an environment which I think we may be where volatility is going to continue to be high and markets are going to move around a lot, and it’s not clear that we’re going to have automatic profits anymore, if we’re in that kind of high volatility market, I think the Total Return Fund is a great choice for investors. What’s your outlook for the strategy in the current market? The market’s in a very interesting place. If you look at the market behavior, my sense is the market is anticipating a recession. From where I sit—and I talk to companies in all kinds of industries across America—there’s really no evidence of recession today. There’s some evidence of inflation in the supply chains of most industrial companies. They will tell you that they are facing inflation, whether it be materials or labor, but when you look at the headline inflation numbers, media outlets would tell you that there is no inflation. I would argue with that. So I think there’s some inflation. The market doesn’t. The market thinks the recession is coming really soon. I see no evidence of that. So the market is in consternation now. We have a yield curve that was flattening, almost inverting. The market hated that. So there’s volatility, and in volatility there’s opportunity. Stocks matter. Businesses matter. Valuations matter. So I think that with lower valuations today—and the valuations in our portfolio are more interesting than they’ve been in a while—I think the setup for ’19 looks really, really good. Most of the opportunities that we’re seeing now are in the more cyclical areas, whether it’s auto related or industrial related, materials related, trucking. Cyclical industries have had their valuations really compressed, and the businesses are still performing. So the world is worried about a peak. Might we be at a peak? Sure, but even if we come down a little bit, there is nothing in the world yet that tells me we’re coming down a lot. So with that, the valuation change has been dramatic, and the opportunities I think are greater. How do you feel about the current risk/reward tradeoff? I look at the risk-reward of all my stocks all the time, and for the first time in a long time the risk/rewards are looking a lot more interesting than we’ve seen them really in the past three, four, or five years, and when that happens, sometimes that tells you that the setup going forward is really good. So I’m hopeful for ’19.